As I told in my previous post, we are emphasizing the concept of recycling to CJ. "When you're saving one can, you're saving toucans." , We often use the tag line @home and CJ has memorized it. This tag line or pun appears in a Public service ad or announcement that comes in PBS kids. Whenever CJ puts something in recycle bin she says Hey! we are saving toucans! I was thrilled and excited when Rashmie from Mommy Labs asked us to participate in her Forest Fiesta project to celebrate World Environment Day(June 5) and the theme forests! Yesterday night when I was searching information about Public service ads on PBS kids website, I stumbled upon this wonderful Eekoworld(Environmental Education for Kids Online). Eekoworld website is part of PBS kids site. The site says that Eekoworld is designed to help children between the ages of 6 and 9. But I feel its perfect for kids above age 3. 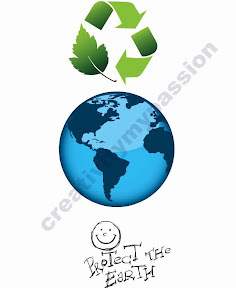 In the interactive Eekoworld, children can create their own EekoCreature, help the creature overcome environmental issues . Then explore EekoHouse a simulation resembling the real home life that shows how decisions the children make affect the environment and their EekoCreature. For more details, do visit the website. Its just educational!